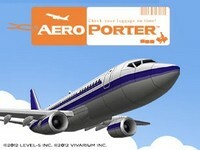 Aero Porter is the second downloadable title on the Nintendo 3DS from Level-5. This game is a very unique puzzler. We have to get the baggage onto the planes. There are rotational circles that the baggage gets loaded onto. Players drop arms on the rotational circles on one side, and raise them up on another part. The concept in Aero Porter is really simple and easy to learn. Where it gets complicated is when there are so many different colors, and luggage keeps coming into the top circle. Also we raise and lower all the arms at the same time. Flights take off at certain intervals so we have to be faster in some areas than in others. Players are given a generous amount of time to reach the goals in each and every day they play Aero Porter. If it is too long for you, then you can just quit the day early. I liked this feature personally especially when I reached the goal. The controls in Aero Porter are simple to pick up. The 'R' button is used to lower the arms of the carousals, the 'L' buttons raises the carousal arms, and the 'A' button will load the bags on the planes. The bags have to all be the same color and the right color for that plane. Otherwise it will not load. Aero Porter is very kind in explaining everything and starting new players in a quick tutorial. Aero Porter is a lot of fun to play. There are suspicious packages that will go boom if they are not disposed of quickly. This is where the ESRB found the Mild Fantasy Violence. Players can also miss getting the luggage on a plane to the dismay of everyone at the airport. Aero Porter is reasonably priced at $4.99 US Dollars. Families can pick up a really fun puzzle game for just under five dollars. I am very thankful that I was able to play and review Aero Porter on the Nintendo 3DS.